In a PERFECT world where everyone DESTROYS everything and eats HUMAN FLESH, one ZOMBIE has had enough: BUCK BURGER. When he rebels at the natural DISORDER, his marriage starts DETERIORATING and a doctor prescribes him an ANTI-DEPRESSANT. Buck meets a beautiful GREEN-HAIRED pharmacist fairy named FAIRY_26 and quickly becomes a pawn in a COLD WAR between zombies and SUPERNATURAL CREATURES. As Fairy_26 flies him between her tree-branch apartment in FAIRYLAND and an aircraft-carrier PIRATE SHIP in a zombie-infested DYSTOPIA, Buck Burger struggles to make sense of it all and remain FAITHFUL to his OVERBEARING wife. Does 16-year-old SPIRITUAL LEADER and pirate GUY BOY MAN make an appearance? Of course Are there MIND-CONTROLLING ALBINOS? 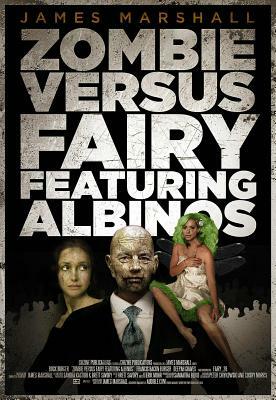 Obviously Is there hot ZOMBIE-ON-FAIRY action? Maybe WHY AREN'T YOU READING THIS YET? James Marshall's short fiction has appeared in numerous Canadian literary magazines: PRISM International, The Malahat Review, Exile, The Literary Quarterly, and Prairie Fire. One of his stories was nominated for the National Magazine Award for fiction, the M&S Journey Prize, and it was a finalist in the 22nd Annual Western Magazine Awards, 2004. A collection of his short stories, Let's Not Let a Little Thing Like the End of the World Come Between Us, was published by Thistledown Press in 2004, and it was shortlisted for both the 2005 Commonwealth Writers' Prize (Caribbean and Canada Region) in the 'Best First Book' category, and the ReLit Award for short fiction. His first novel in the How To End Human Suffering series, Ninja Versus Pirate Featuring Zombies, was released last year. James lives and writes in BC.